The HAUG static bar EI HRN is intended for applications in temperatures up to +130°C. It is a powerful static eliminator symmetrically generating positive and negative ions by means of alternating voltage. This process ensures that the area around the pins of the bar is ionized. Its design fulfills any conceivable mechanical engineering requirements. Even under high temperatures and at high feed speeds, HAUG ionization systems reliably and effectively eliminate surface charges that interfere with production. The HAUG System X-2000 coaxial high-voltage plug-and-socket connection offers unique benefits. The gas-tight high-voltage plug can be connected to HAUG power packs without tools. The highly flexible, coaxially shielded safety cable is used to connect the ionizing unit to the voltage supply source (power pack). The round design of the EI HRN static bar permits rotable adjustment in the direction of travel of the material with millimeter precision. 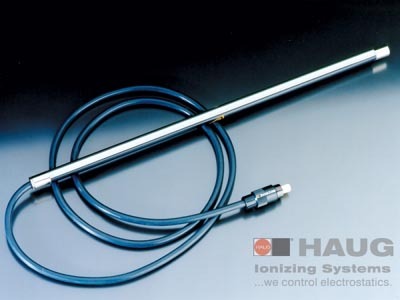 The static ionizing bar EI HRN is absolutely safe to touch. The special low-wear electrodes ensure a long life. EI HRA without HV-cable, suitable for connection of a highly flexible, detachable HV-connection cable (type HVK Flex). EI HRD tandem version (2 bars). Permanently connected high-voltage cable, not detachable from bar. HAUG EI HRN static bars are used in the textile industry on ironing, folding and finishing machines, for plastics processing on extruders, blow-molding machines and calenders, in the manufacture of fibreglass and on printing machines as well as for many other industrial applications. It is recommended that two static ionizing bars be installed above and below the material web. Static bars EI HRN / EI HRA are suitable for machine speeds ≤ 100 m/min. The tandem version EI HRD is suitable for machine speeds ≥ 100 m/min.